"Battle Between the French Frigate Surveillante and the British Frigate Quebec, 6 October 1779," Auguste-Louis de Rossel de Cercy, Musée national de la Marine (Wikimedia Commons). I had intended to analyze this image for the slops clothes of the various sailors, but there are a couple of reasons I'm choosing not to: in the first, the sailors are far too small in the image to make any but the most generalized conclusions. In the second, the painter is a French artist, and likely not as familiar with the appearance of British sailors as he is with French. Even so, I'm choosing to share this. It's an impressive image with a great play of light and dark. Closer inspection adds life to the otherwise inanimate frigates: the sailors may not have much detail, but you can still make out their desperation as they flee from the exploding vessel. 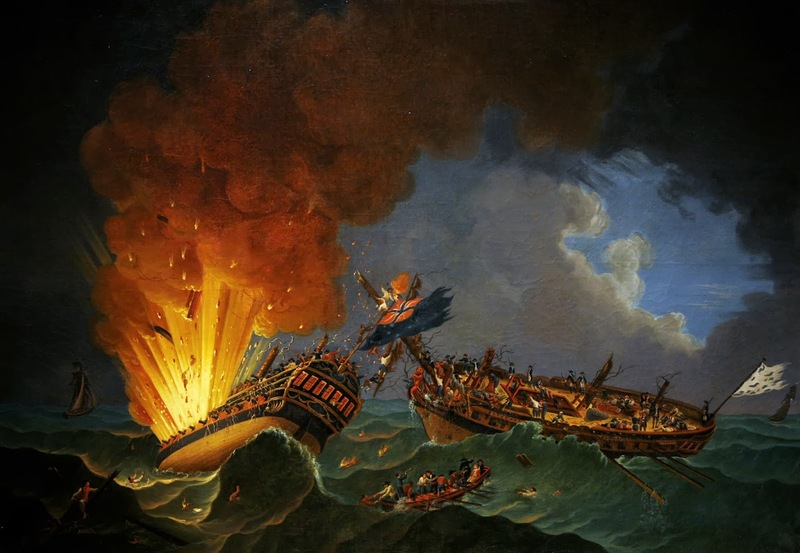 Many images were made of the battle between the Surveillante and HMS Quebec, but this has to be my favorite.